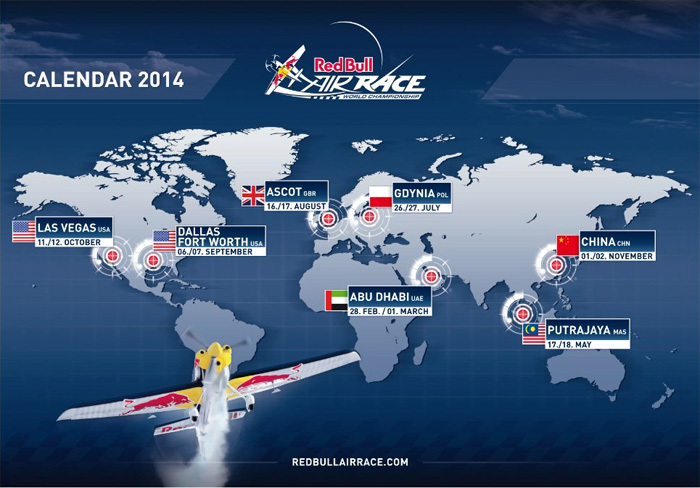 The Red Bull Air Race World Championship will be back in the skies in February 2014 with a full seven-race World Championship staged in 6 countries on 3 continents. The return of the world’s fastest motorsport series was announced at a news conference at the Putrajaya Maritime Centre in Malaysia on Tuesday. The series will be back with the defending World Champion in the 12-pilot field after it took a three-year break to improve safety and reorganize. There will be a number of technical improvements, including standard engines and propellers for all pilots, changes to the lightweight nylon pylon material to make them even easier to burst apart if they are clipped by plane wings and raising the height of the pylons that the pilots pass through from 20 to 25 meters. The modus and rules have also been tightened, for example to prevent any pilots from exceeding the set limits. Another safety feature and also a sporting highlight is the new Challengers Cup competition that will be introduced in 2014. It will give new pilots who qualify for that stepping-stone competition valuable experience racing in the tracks on certain Red Bull Air Race stops. They will also participate in several training camps during the season. “I am very pleased to see the Red Bull Air Race comes back as it is truly an event that gives worldwide exposure to air sports. The improvements made to the race format and race track by the Red Bull Air Race Management are convincing and will no doubt add extra attractiveness to the event,” said FAI President Dr. John Grubbström. In the sport created in 2003 and watched by millions of fans at 50 races until being suspended from 2011, the competitors race in high-performance airplanes between 15 and 25 meters above the ground and navigate a challenging obstacle course of Air Gate pylons at speeds of up to 370 kph. Great news, I’ll be looking forward to that. Iwould very much like to attend the flying display at Ascot Racecourse in August 2014 please advise on admission. Can’t wait – really looking forward to this. Haven’t been to a Red Bull race for a number of years!